Author: Jouni Filip Maho. Series edited by: Franz Rottland †, Rainer Voßen. 24 pp. Roman, 844 pp. With this substantial work the author aims to cover any and all publications dealing with Bantu languages. Although it contains a fair amount of non-linguistic references, it is nonetheless aimed chiefly at linguists and others interested in the study of languages. The bibliography contains roughly 17,000 unique references. Of these, approximately 11,500 are linguistic works of some sort, e.g. vocabularies, dictionaries, grammars, descriptive and/or structural analyses, sociolinguistic studies, and so on and so forth. This also includes ethnographic works with (apparent) useful lexical data. The purely non-linguistic references comprise mainly ethnographic and historical studies. They have been included since they often contain valuable information also for linguists, such as data on demographics, speaker numbers, distributions, historical backgrounds, etc. The bibliography contains reference to some 1,700 dictionaries and/or lengthy vocabularies for more than 400 distinct language varieties (a figure that includes second and subsequent editions, too, but not reprints). Moreover, there are references to ca. 1,500 grammar descriptions for a little more than 340 language varieties. 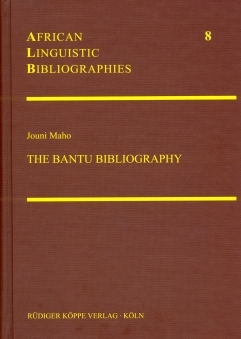 Following the bibliographical sections, there is an appendix containing a classified list of the Bantu languages, after which there are two indeces, one for language names and one for author names. [...] the library of every research institute that takes Bantu studies and itself seriously should have one copy of this authoritative work.